To provide measurement for the reduction of excess free radical activity (oxidative stress) in the blood stream using Cellfood – a nutritional supplement. What the test means: The USPChallenge Test is a well-known test showing the ability of a substance to retard the growth of tested pathogens, much like a preservative protects the contents of a bottle. 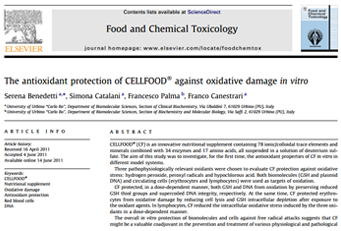 These results show that Cellfood? destroyed all of the five pathogens tested, and they did not return during the entire 28 day testing period.